Sultan Hamid II from Pontianak, supervised by Sukarno, and was adopted as the national emblem on 11 February 1950. Indonesia national emblem to be presented to the government. Garuda Pancasila design by Sultan Hamid II, still featuring an anthropomorphic Garuda. Masyumi expressed their objection and stated that the bird with human neck and shoulders with both hands holding the Pancasila shield was too mythical. Garuda Pancasila adopted on 11 February 1950, still without crest and with different position of talons. Garuda Pancasila on a c. 1987 poster; each tenet of the Pancasila is written besides its symbol. Garuda Pancasila, which raised the controversy and protest whether a partisan non governmental organisations should be allowed on using the national emblem as their ralying symbol. The controversy also raised from Prabowo's 2014 presidential TV campaign music video that displaying golden Garuda Pancasila — which looks like the German imperial eagle, in aesthetic imagery reminiscent of Nazi's style fascism. Garuda Pancasila displayed in the Ruang Kemerdekaan (Independence Room) at the National Monument (Monas), Jakarta. These numbers of feathers correspond to "17/8/1945" international date format for Indonesian Independence Day. Emblems Each section of the shield has a symbol corresponding to the Pancasila principles laid down by its founder, President Sukarno. The numbers of some elements in these symbols might evokes certain numbers, such as 17 which represents the 17 August and the number 5 which represent Pancasila itself. Escutcheon The escutcheon is a martial symbol, representing the defence of the country. It is divided into five sections: a background divided into quarters, coloured red and white (the colours of the national flag) in a checkerboard pattern; and a smaller, concentric shield, black in background. A thick, black line lies horizontally across the shield, symbolising the equator which passes through the Indonesian archipelago. Confucianism and Buddhism, but of the secular ideology of socialism as well. This tenet of Pancasila has always been controversial, for it suggests compulsory religious belief as well as compulsory monotheism. 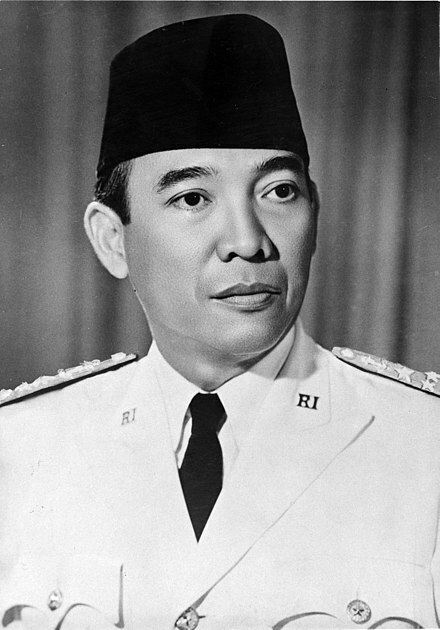 Supporters of Sukarno's legacy, however, believe that this tenet was meant to unify Indonesia's population, who have diverse faiths and beliefs. Chain In the bottom right quarter, on a red background, is a chain made up of square and round links. This chain represents successive human generations, with the round links representing women and the square links representing men. There are 9 round links and 8 square links, together they sum the number 17. The chain corresponds to the second principle of the Pancasila, the principle of "Just and Civilized Humanity". Sukarno and the Nationalists, is one country out of many far-flung cultural roots. Indonesia Democratic Party of Struggle. Rice and cotton In the lower left quarter, on a white background, are a gold-and-white paddy and cotton. There are 17 seeds of rice and 5 cotton buds. These represent the fifth Pancasila principle, the principle of "Social Justice for the Entire People of Indonesia". The rice and cotton represent sustenance and livelihood. Garuda Pancasila song was composed by Sudharnoto as a patriotic song to commemorate the Indonesian struggle. Republic of Indonesia (1999) Indonesia 1999: An Official Handbook (No ISBN).